Khao Sok Lake Volunteers visit Kuraburi! Two volunteers helping in the Khao Sok Lake office took the time to come visit Andaman Discoveries last month! This trip was meant to help them become familiar with our community based tourism style! As the first volunteers for Andaman Discoveries Ta Khun, we had the great opportunity to go and visit two homestays in Kho Phra Thong and Ban Talae Nok as well as to see the Moken village on the Surin Islands. After those six days of intensive experiences and unique cultural impressions we are overwhelmed by the great hospitality and friendliness of the local communities! Our first visit brought us to Kho Phra Thong which is located only 30 minutes away from Kuraburi, reachable with a traditional long tail boat. 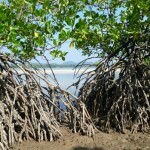 We would describe the island as a quiet fishing village which has a great variety of nature to explore. It was really impressive to see the diversity of vegetation there. 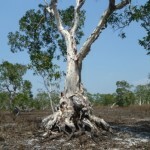 The middle of the island is a sprawling territory which emerges each year during the dry season. On a really cool old tractor, which has been reconstructed to carry up to 5 people, our guide took us to explore the steppe. We were told that during rainy season this region floods and becomes only accessible by boat. 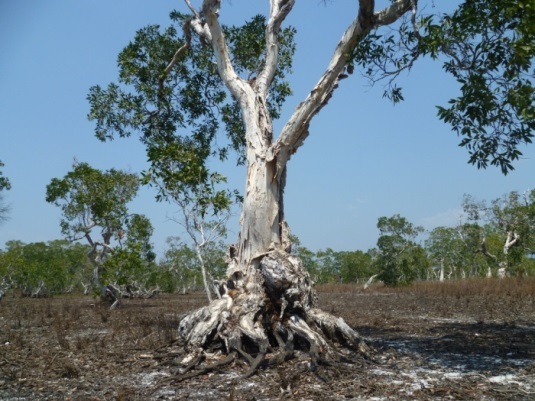 But in the dry season the environment made us feel more like being in an African savanna. You could easily imagine zebras crossing your path while being on a safari. 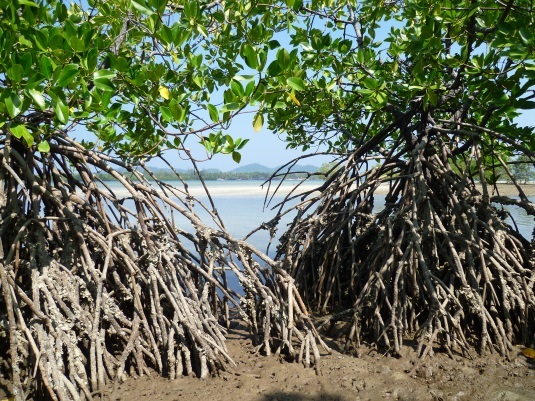 The “Savanna” transitions into the shoreline around the island where mangroves grow rapidly and are inhabited by Macaque monkeys, snakes, and all sorts of aquatic life. Having explored the island on foot, our guide then took us on a kayak excursion around the coast. One of the remarkable things on the island of Ko Phra Thong is the Turtle breeding station they have located just next to the pier. Once a year they receive around 30 turtles from a rescue station in Phuket which they foster for about 9-12 months until they reach sufficient size to be released into the open ocean. We were particularly impressed with the responsible behaviour in terms of waste -disposal and -management. It was great to see the practice of waste separation being practiced over the whole island as another step towards sustainable thinking. The cozy village of Ban Talae Nok is only a 40 minutes drive north of Kuraburi. In this village there are no resorts to be found and through our host family we were able to experience the authentic rhythm of rural Thailand. We had the great opportunity to dip into their daily life and routines and gain valuable insights. They taught us how they produce soap out of natural ingredients flavoured with local spices. We will now remember this nice activity with our own souvenir of handmade soap. Apart from the soap production another craft we acquired was the fabrication of roof parts, out of Nypa Palm leaves. 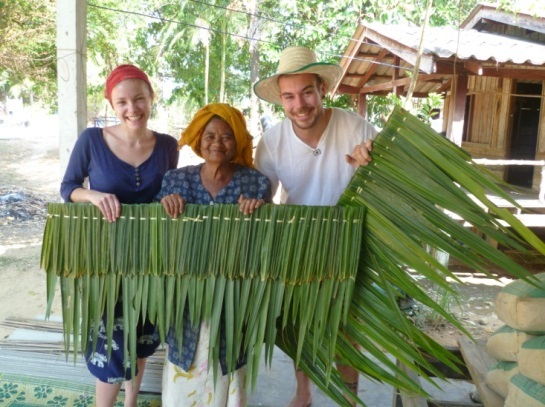 Individual leaves are weaved to a tile of the roof which the locals are able to sell on regular bases since the Nypa Palm roofs have a durability of only 3 years and are still the most affordable ones. The Andaman Sea, provides an extraordinary supply of food,and it is only a few hundred meters down to the beach. Local fishermen showed us how they fish on the shore, for what you only need two people and a net. You go into the water so that the water is just below your shoulders and then you roll out the net and pull back the two ends in the shape of a sickle. After a good catch, we enjoyed a lovely beach BBQ together with our host family. We very much enjoyed the cultural exchange with our host family and the other community members. One example was when we were walking around the village we passed some women, who were about to make some cigarette papers out of palm leaves. They saw our interest and showed us immediately how it works and made us try it. The fact that we couldn’t understand Thai and they neither were able to explain it in English didn’t bother anyone because it made the cultural experience even more intense. We are very thankful for the way they welcomed us and would be happy to see them again during the next months of our stay in Thailand. 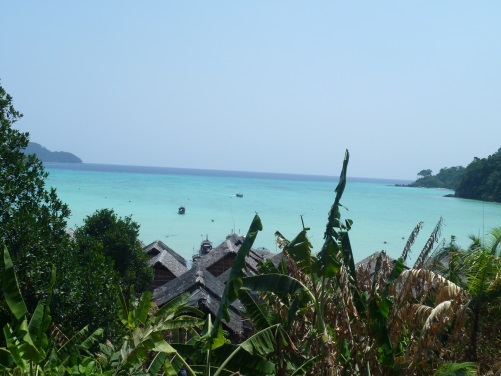 We concluded our trip with a stunning visit to the Moken village on the Koh Surin Islands. One of the last tribes of sea nomads called Moken live there, settled in a village which they had to rebuild after the tsunami 2004. We had the great chance to gather cultural insights about how they build their “Kabang” boats, which plants they use for healing and learned about unique eatable fruits on this paradise of an island. Another special personal highlight for us was to get to row the “hunting boat” and to do spear-fishing. After a thorough instruction of our Moken guide “Nin”, we even caught the fake fish, some coconut fruit, with the spear. Apart from all the rich cultural experience, the snorkeling at the coral reef there was simply amazing! In crystal clear water we saw all sorts of fishes, in all sorts of colors. Nin even provided guidance during the snorkel and pointed out a turtle hiding under a coral, which we would have never spotted without him. The overnight stay was arranged in a tent on one of the most wonderful beaches I’ve ever seen!